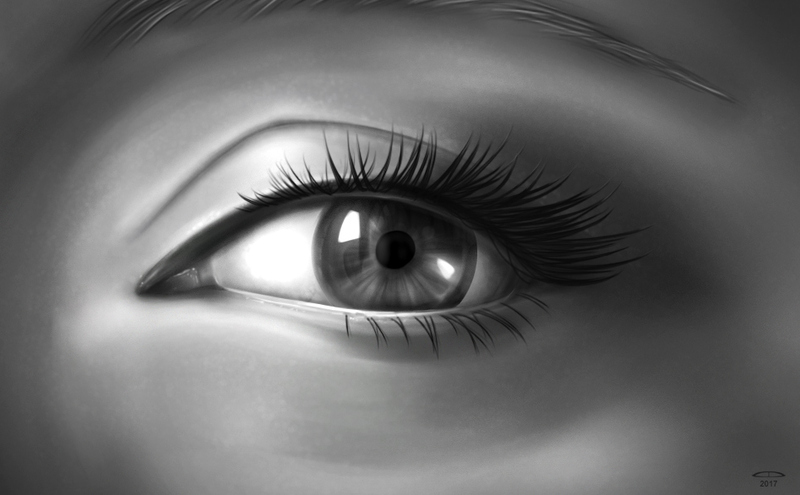 Not much to say about this one really… I wanted to practice a simple subject so I painted an eye. I wasn’t trying to get TOO detailed and wanted to focus on just rendering out an idea quickly without spending too much time on it but still giving it the element of realism. I think it took maybe 4-5 hours total over a couple days time. Overall I’m pleased but I could have probably put a little more work into the eyelashes and made the eye itself a little more “watery”. However, the whole focus of this exercise was to be finished in a relatively quick timeline. I could sit here for days and keep putting more and more detail into things, but that’s not what I’m after right now. The most difficult part for me is knowing when to just stop and call something finished. Follow along as I document my progress during some of my personal projects. Occasionally I shoot out quick updates or share design work I find interesting. Have a project I can help with? General questions for me? Want to buy me a beer? © 2017 Chris Denslow. All rights reserved.